It is on March 21 of the English calendar year 2019 Bengalis and citizens of other parts of India celebrate Holi or Dol Jatra (in West Bengal, Tripura and Bangladesh) amidst spectre of friendship and fraternity. There was a time when Holi or Dol Jatra festival used to be rated as festival of only Hindu religion but now with the passing away of time along with advancement of the science and technology the celebration is assuming universal dimension thereby imbibing bonds of friendship and fraternity under one common platform that is meant for the people of all religions and languages in both India and Bangladesh along with rest of the globe. The modern social and political situation is taking a vicious turn with people from one religion is hurling stones and brickbats along with vices to the followers of other religion to exercise personal vengeance. So festival of the stature of Holi or Dol Jatra will no doubt unite people with the bond of religion and language under one banner. Though some are deeply motivated towards good, most of them remain incorrigible till date. Holi or Dol Jatra celebration has now become common among citizens of India, Bangladesh as well as in several European and American nations. Till date there are many among my online readers of both India and Bangladesh who still remain ignorant about the mythological aspect behind the celebration of Holi or Dol Jatra. Thus in the subsequent paragraph detailed introspection will be made by this writer about the mythological and historical background of Holi or Dol Jatra festival. Whenever we analyse deeply about Holi or Doljatra it is pertinent on the part of this writer to introspect about the mythological background pertaining to the celebrations. The logic behind highlighting about it will make the piece more exhilarating and absorbing. It was long time back when there was a demon king by the name of Hiranyakashyap who always emerged victor over the eternity. On account of his victorious prowess he tried to express extreme arrogance over others. The most distressing part is that his son Prahlad went deadly against his father’s policy thus decided to worship Lord Narayana. Lord Hiranyakashipu as an act of vengeance tried to assassinate his son Prahlad but was saved in the nick of time by Lord Vishnu. Lord Vishnu thus requested earnestly his sister Holika to jump into the fire with Prahlad in her lap. In this regard King Hiranyakashipu became scared that Holika’s blessings might be beneficial for his son Prahlad. Holika being such a pious person was saved from any untoward circumstances mainly with the blessings of the Superpower. Prahlad on the other hand escaped unharmed with the chanting of blessings of Lord Narayana. The Lord blessed him for his utmost devotion towards him. The term, ‘Holi’ has been derived from the name ‘Holika’. The festival of Holi is celebrated all over India especially in the Hindi speaking belt but in the dominated belt in West Bengal, Tripura as well as in our closer and friendly Saarc neighbour Peoples Republic of Bangladesh. The purpose of celebrating Holi or Dol Jatra festival among the Bengalis is to portray positive feelings over evil ones. In this regard one glaring point to be noted as per religious belief of human beings are concerned, we must pay our reverence deeply to the good spirit. Those spreading hatred should be sidetracked badly by advanced societies of the modern age. Holi or Doljatra festival has reputed historical background. 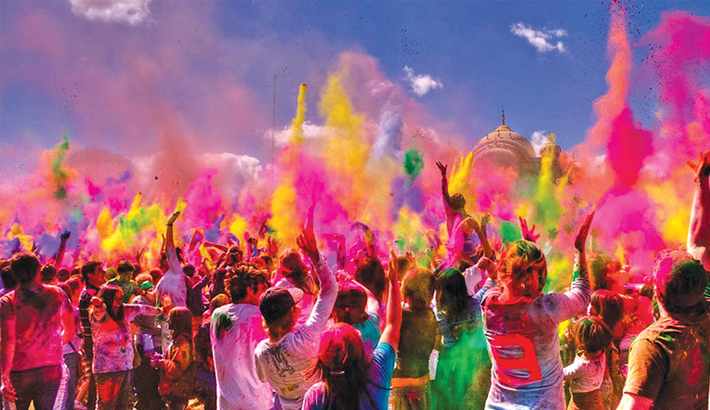 There are various historical anecdotes available within us pertaining to the origination of Holi or Doljatra festival. Some opine that origination of Holi took place during 7th century B.C. As per views of others Holi or Doljatra is also celebrated as the birthday of Sri Chaitanya Mahaprabhu. Also, in Shantiniketan the day is celebrated as Basanta Utsav. The day has also cast tremendous influence upon the creative aspect of Rabindranath Tagore. With the advent of Basanta Utsav it ushers in new hopes and aspirations in the life of human beings. In India the festival in known as Holi or Doljatra, in Bangladesh it is called Doljatra, in Italy it is known as the Battle of the oranges, Boreyong Mud Festival, Els Fariata and La Battela Del Firo; Iscon India calls it world-Holi or Doljatra. Summing up the above views one point will surmise in our mind that festival of the stature of Holi or Dol Jatra should be celebrated all over India, Bangladesh and other parts of the globe. This will imbibe citizens of the globe under one banner instead of instigating divisive forces all around the globe. The writer is from Kolkata, India.